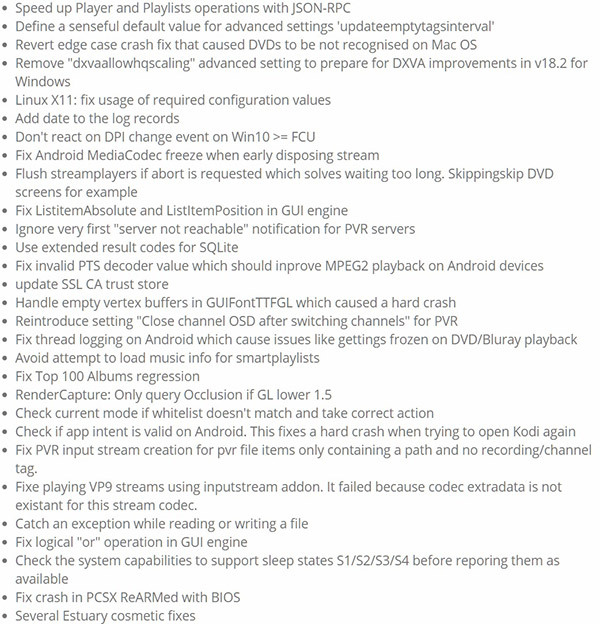 Kodi 18.1 RC1 release candidate 1 build APK download for Android, iOS app IPA, along with Windows and Mac versions are out now. After months upon months of alpha releases, followed by beta releases, and finally release candidates, the team behind Kodi finally took the wraps off of Kodi v18 a couple of weeks ago. That update was hotly anticipated, and it brought with it plenty of new and updated features. Unfortunately, it also brought with it a couple of bugs despite all of the testing that went into getting it ready, and now the team has a Kodi 18.1 RC1 update ready for people to try. The new release candidate is available to download now, and there is a lengthy list of changes that can be read over on the Kodi blog for those who want to know exactly what has changed and what has not. Some of the changes are purely cosmetic, while others add to features. Yet more fix bugs that have been identified since v18 went live to the public, something that is always going to happen when something goes from a testing phase into a phase where it’s widely available to everyone. Thankfully, the team isn’t messing around when it comes to fixing things. This update comes just two weeks after the big v18 update and as the announcement post says, we can expect regular v18 updates in the months to come. For now, check this release candidate out if you want to be on the bleeding edge, and especially if you are experiencing any of the issues that are apparently fixed in this update. Simply head over to kodi.tv/download to get started. When my IP changes (it changes almost every time I reboot my PC) my remote drives/shares are obviously no longer available… I was hoping that by now we could edit the remote DLNA source to find them again, but sadly this STILL crashes the program and we have to add the source from scratch. Oh well. Still no thumbnails from DLNA remote shared folders and drives. Oh well. When I click down to exit KODI the default button is now the Favorites button. It used to be the power off button. Oh well… just another click, right?